Repurposing the Deep Impact spacecraft to visit Comet Hartley 2, the EPOXI mission continues its epic journey of looking for brave new worlds. Aligned with national science and mathematics standards and designed for formal education (K-12), EPOXI education brings real-world examples of problem-solving and teamwork to educators and students. Discover some of the educational activities below and bring an exciting NASA mission into your classroom! 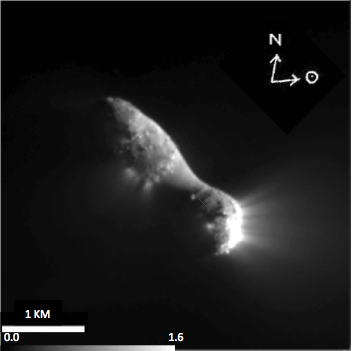 Comparing Comets: In this activity, students will play the role of cometary scientists, using images from Stardust, Deep Impact and EPOXI to study and compare the surfaces of three comet nuclei from close range. Comet Lingo Bingo: Designed to engage students in gathering a thorough and flexible knowledge of comet science, as well as of the NASA missions of Discovery that are helping scientists and engineers expand that knowledge. Students read The Comet Chronicle - a fun comet tabloid written to provide basic understanding of comet science and background of NASA's past and ongoing explorations of comets. Student teams then participate in a bingo game in which they answer questions of varying complexity, highlighting pertinent vocabulary and concepts relating to comets and their missions. Seeing in 3-D: In this activity, students build a stereoscope to view the 3-D details in 2-D pairs of images taken by the Deep Impact and Stardust spacecrafts of comet Tempel 1 and comet Wild 2. Students can then apply their new understanding to make sense of visible images as they arrive from current missions. 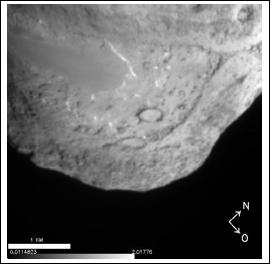 For example, when new images arrive from Discovery missions EPOXI, Stardust-NExT and Dawn as they reach their respective targets in 2010 and 2011, students have a tool to help them appreciate new science. Space Math @ NASA: Visit this NASA resource to download hundreds of math problems for grades K12 featuring a behind the scenes look at NASA press releases and discoveries. The problems range from simple scaling and proportions to algebra and calculus, and cover topics spanning all NASA science and engineering activities. Extreme Navigation: A standards aligned activity in which students learn how mission planners design a spacecraft/mission rendezvous. Students explore the interactions of the spacecraft and solar system objects in a simulation that helps them determine the trajectory the navigation team should use for a successful rendezvous between the spacecraft and target comet. 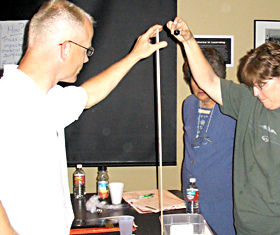 Comet on a Stick: Stand alone activity in which students examine their concepts of a comet using the scientific method by designing and building a model of a comet from common household items. The activity is aligned with national education standards and is designed for students in grades 3-5, but can be used with students of a wide age range. 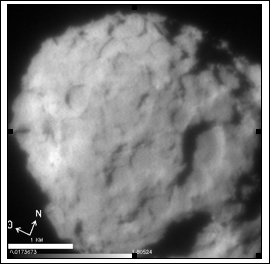 Exploring Comets and Modeling Mission Success: Plethora of activities and information about comet basics for grades 5-9, although some activities are suitable for grades 2-12. The activities can stand alone or be used together as an entire comet unit. The materials were originally designed for the Deep Impact Mission Education and are aligned with national education standards. Teaching with Story and Song: Teach about comets by blending myth, story, song and hands-on activities. This page contains the C-O-M-E-T-S Song for grades K-4 and the C-O-M-E-T-S Rap Song for grades 5-9. Also includes The Comet Sisters, a story filled with comet facts and value lessons. Eyes on the Skies: An activity for educators and high school learners to use while planning and conducting a guided inquiry that involves an observation of a faint comet over time. Learners will gain practice star hopping, recording location and brightness observations, and forming questions. Feel the Impact: Materials designed for use with visually-impaired students for the Deep Impact Mission. Students are introduced to the basics of comets and their place in the solar system, and they conduct their own research by creating and analyzing their own craters in the classroom. Feel the Impact is designed for grades 5-8. Spacecraft Model: EPOXI's spacecraft is the Deep Impact Flyby spacecraft. This page contains printable build-your-own models of the spacecraft for three different age ranges and difficulty levels. Journey through the Universe: A customizable program from the National Center for Earth and Space Science Education for K-12 students, teachers, and families. The program includes lesson packages, access to scientists and engineers, chances for parents to engage in their children's education, and a national framework of educational institutions, business, and the public. Planet Quest: A NASA educational product designed around the theme of searching for extrasolar planets. It includes 4 NCTM standard aligned activities for grades 5-12. In the activities students learn how mathematics is used to solve real-world problems. Kepler Discovery Mission, which is searching for habitable planets, has standard aligned activities about planet finding for students from K-College and beyond. The mission also has models and simulations that help illustrate the key concepts behind searching for habitable planets. Take the Measure of the Universe: NASA/JPL poster with information and activities for the Space Interferometry Mission (SIM) that will create a detailed map of stars in our galaxy and help look for extrasolar planets. 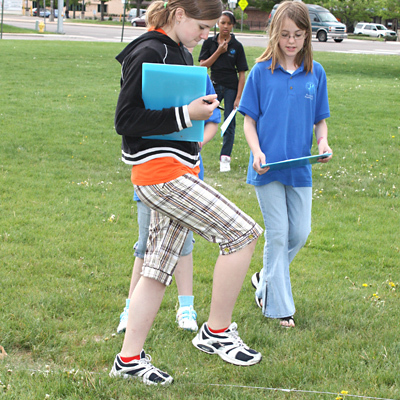 In the activities students apply the methods used by SIM to measure distances to stars to measure the size of a tree, the Earth, and our Galaxy.